Written by Joni and Ntsiki on June 4, 2017 . Posted in Health. Your brain likes to be in control. You receive a boost of dopamine (the reward brain hormone) when you’re feeling confident, organised and comfortable dealing with a situation. So, when you are multi-tasking, your brain doesn’t feel in control. In fact, an interruption of just a few seconds can triple the number of errors you make with the task you are trying to focus on. Important tasks require that you put your smart phones and other distractions aside. Research shows that one hour of well-focused time is equivalent to four hours of time filled with distractions. 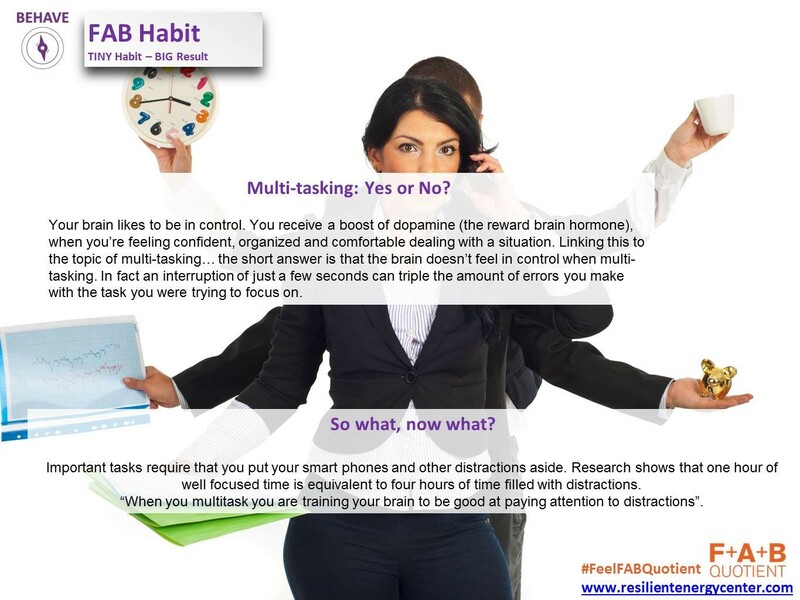 When you multi-task, you are training your brain to be good at paying attention to distractions.